What is your ideal vacation to Japan? Do you prefer the bright lights and skyscrapers of Tokyo? Geisha spotting and temple visiting in the ancient city of Kyoto? Or how about taking a train to a lesser-known prefecture and relaxing in the hot springs? The Japan National Tourism Organization (JNTO) wants you to discover different areas of Japan through its new Global Campaign, Enjoy My Japan, which launched in February. Broaden your scope of the country and go beyond the traditional travel hotspots of Tokyo, Kyoto, and Osaka and find local, traditional, and natural wonders. Go to the Enjoy My Japan campaign online here, and answer three questions. The website will generate a personalized movie based on your answers and provide details about the featured locations to help you plan your trip. You can check out my personalized movie here! 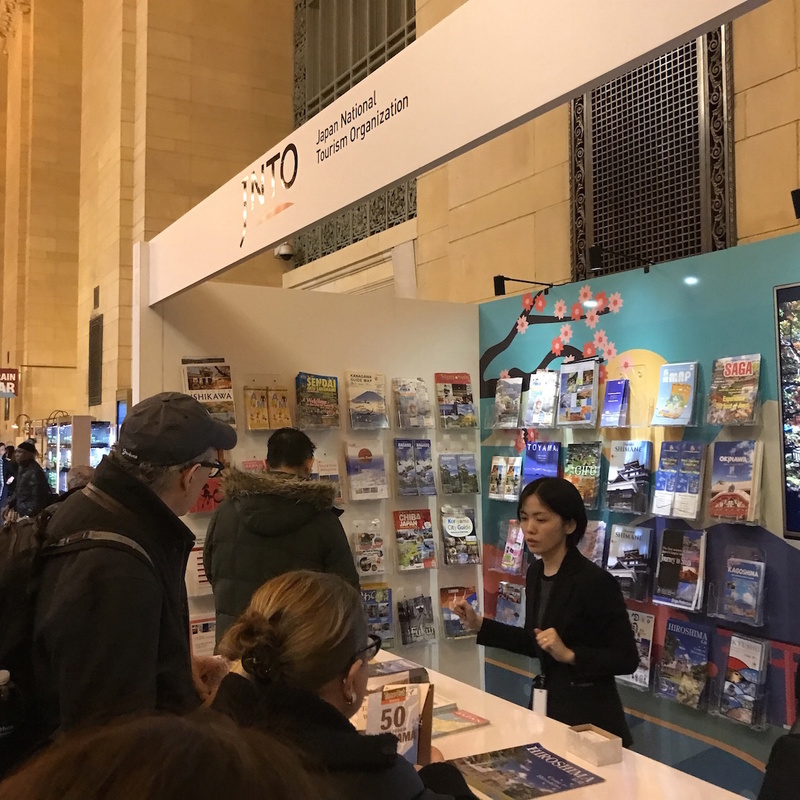 You can learn more about the campaign and talk to a JNTO representative in person at Japan Week 2018, currently happening in Vanderbilt Hall at Grand Central Terminal until 7:00 p.m. tonight and from 9:00 a.m. until 5:00 p.m. Saturday. The ultimate goal of the event is to encourage travel to all parts of Japan. JNTO is aiming to hit 40 million visitors to Japan by 2020, and Japan Week 2018 gives the organization the opportunity to meet potential travelers face-to-face. In addition to JNTO, travel agencies specializing in Japan, including Amnet, IACE Travel, and H.I.S., have brochures about places that are off Japan’s beaten path. Visitors can take surveys to receive special prizes. Past Japan Week programs have featured food and drink, but you won’t find much of that at Japan Week 2018. (You can still indulge yourself in a yummy katsu sando from Ootoy and wash it down with tea from ITO EN; their new Cold Brew has been their most popular item this year.) Instead, this year’s theme is 3D Trick Art, a phenomenon in Japan. Visitors stand in front of a large-scale interactive work of art that creates the illusion that the objects in the backdrop exist in real life. There are eight total 3D Trick Art photo opportunities that represent different aspects of Japanese culture: Become a piece of sushi, carry an omikoshi (portable shrine), pull a sumo wrestler on a ricksha, balance on a spoon over a bowl of ramen, take part in ohanami (cherry blossom viewing), feed a deer or row a boat at Itsukushima Shrine near Hiroshima, and have an exciting encounter with a plane and a shinkansen (bullet train). JNTO encourages visitors to take the ultimate selfie and participate in their photo contest by following @japanweek on Instagram and posting your 3D Trick Art photo with the hashtag #JapanWeekNYC2018. One lucky participant will win the grand prize of a Fujifilm Instax camera, and nine others will win merchandise from Japan Week’s sponsors and exhibitors. Another type of entertainment that fans of Japan enjoy comes in the form of anime and manga, so JNTO has created another campaign to capture the attention of millennials who will potentially visit Japan. 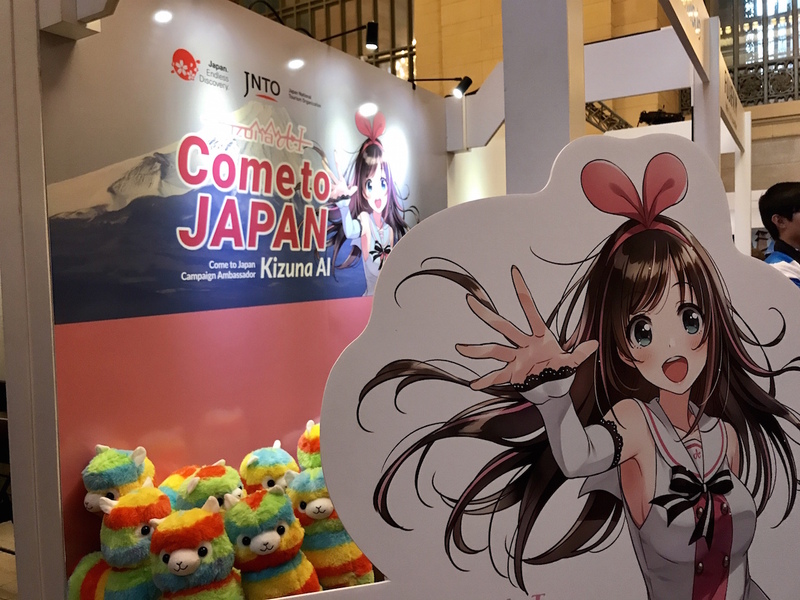 The Kizuna AI promotion is a collaborative effort with Tokyo Otaku Mode, an online store showcasing fan art and products related to manga, anime, cosplay, and Japan’s kawaii subculture. The self-proclaimed world’s first virtual YouTuber, Kizuna AI is an anime character that teaches viewers about Japan through a series of videos focused on food, technology, hot springs, subculture, and traditional/national character. Currently the food video is the only one that is available online, and by watching it viewers can learn about sushi, ramen, and wagashi. Most people who would appreciate the Kizuna AI project are Millennials, a demographic that is important to JNTO. According to a Huffington Post article, Millennials have become essential to the travel industry because “23 percent of them are more likely to travel abroad than their older counterparts.” AAA Spokesperson Tamra Johnson says Millennials are looking for getaways that emphasize experiences, and because buying a home isn’t a priority for them, they have more money to spend on immersive, cultural vacations. One such experiential travel package is an 88-stop pilgrimage that appeared in an anime, and another is a visit to the most famous hot springs in Ehime prefecture. 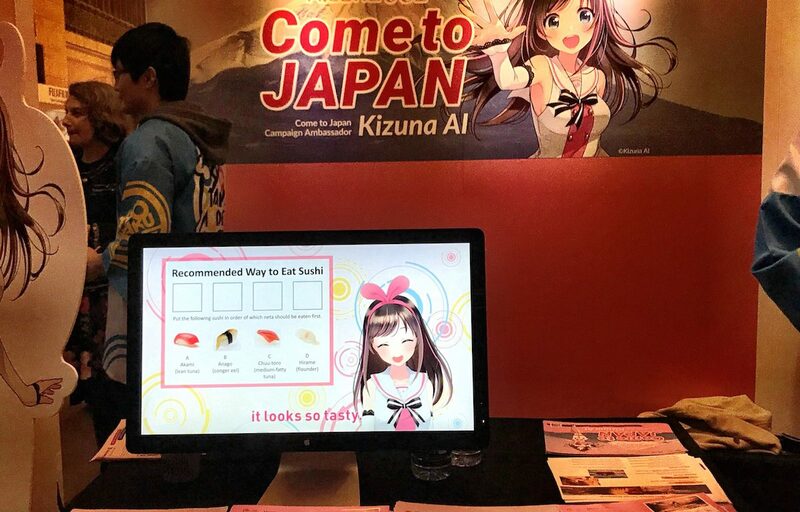 Japan Week 2018 guests who stop by the Kizuna AI booth can watch the culinary culture video, take a quiz, and enter to win several prizes, including two round trip airline tickets to Japan or a rainbow alpaca, which is actually in high demand. Hu says that having the booth at Japan Week 2018 has allowed him to answer people’s specific questions about travel to Japan, in addition to promoting the campaign. Whether you’ve been to Japan zero times or 20 times, stop by Japan Week 2018 for Japan travel inspiration!